Location: A region of Gondor, south of the White Mountains, with a coast on the Bay of Belfalas. The land is bordered by the Anduin and its tributary the River Erui on the east and the River Gilrain on the west. [They]... sat upon the wall with... the Houses of Healing behind them; and away southward before them was the Anduin glittering in the sun, as it flowed away, out of the sight even of Legolas, into the wide flats and green haze of Lebennin and South Ithilien. 'Green are those fields in the songs of my people; but they were dark then, grey wastes in the blackness before us. And over the wide land, trampling unheeded the grass and the flowers, we hunted our foes through a day and a night, until we came at the bitter end to the Great River at last. 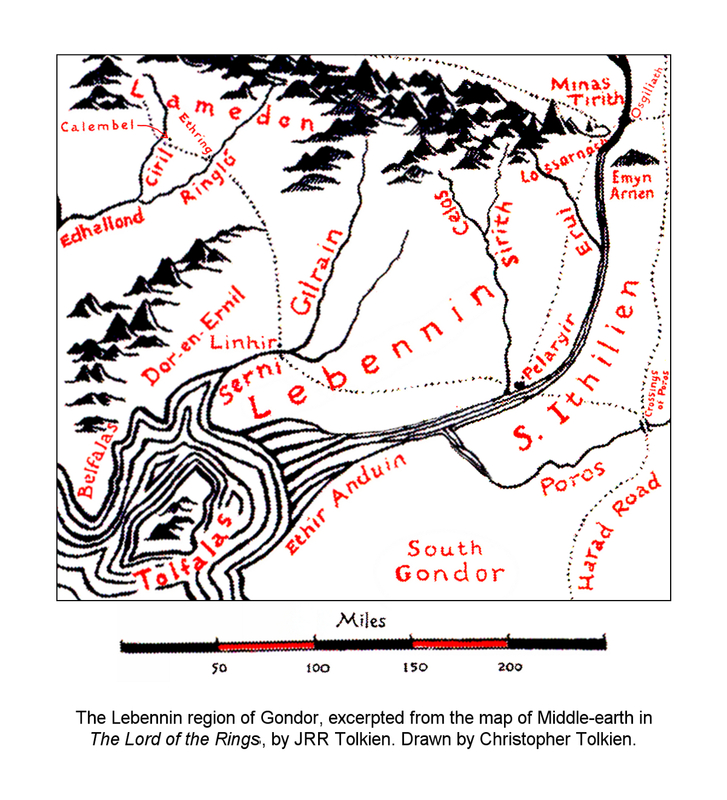 'That is the road to the vales of Tumladen and Lossarnach, and the mountain-villages, and then on to Lebennin,' said Beregond. 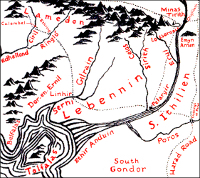 [The] most part of the people of Gondor lived in the seven circles of the City, or in the high vales of the mountain-borders, in Lossarnach, or further south in fair Lebennin with its five swift streams. There dwelt a hardy folk between the mountains and the sea. They were reckoned men of Gondor, yet their blood was mingled, and there were short and swarthy folk among them whose sires came more from the forgotten men who housed in the shadow of the hills in the Dark Years ere the coming of the kings. There was a great battle in Lebennin at the Crossings of Erui, in which much of the best blood in Gondor was shed. Eldacar himself slew Castamir...; but Castamir's sons escaped, and... held out long at Pelargir.